Year: Phase 1: 2014 to 2015. Phase 2: 2015. Approx. Value: Phase 1: £600,000. Phase 2: £2.5 million. 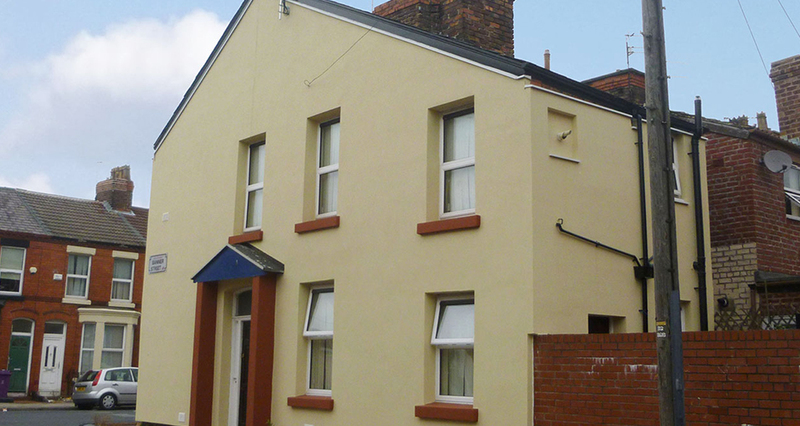 In 2014, Riverside Housing Group secured ERDF funding for the installation of external wall insulation and associated adaptations to various solid walled properties in Merseyside. 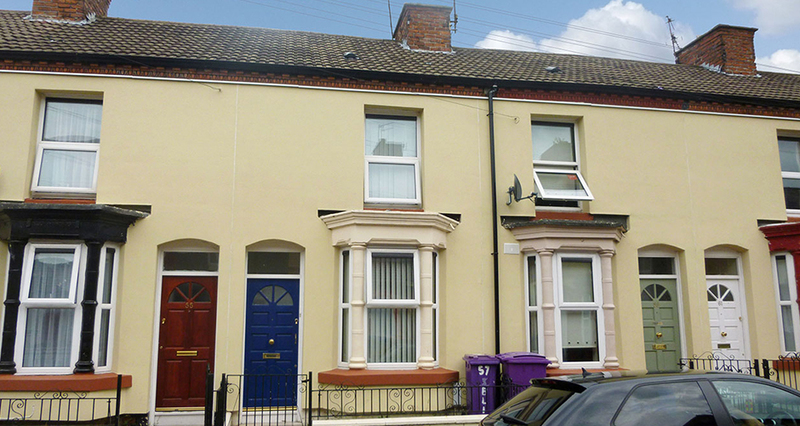 Through the Fusion21 / PfH Insulation Framework, Sustainable Building Services (UK) Ltd tendered and secured lot 3, which entailed work on occupied properties in the Liverpool 15 area. This followed a mini-bid competition that comprised a cost and quality submission. To ensure that Riverside could maximise ERDF match-funding, the project timescales had to be made extremely tight. The ability to make rapid progress would therefore be essential. When planning for this, SBS recognised the need to work proactively with the client to ensure all targets / information requirements were met. By using its large in-house team of specialists (including over 100 SWI installers), SBS was able to demonstrate that it could adhere to the very tight contract programme. As a contractor with ERDF experience, SBS was also able to offer the necessary support to meet all funding requirements. On notification of contract award, SBS immediately mobilised its team, which included a tenant liaison officer, who played a vital role in ensuring that the programme was kept on schedule. Letter drops to all the tenants started without delay and EPC assessments were carried out to enable the works to start. Scaffolding was erected almost immediately thereafter. The tenant liaison officer maintained constant dialogue with residents to ensure access could be maintained throughout. This kept the programme consistently on track. ERDF funding compliance required regular reporting on materials delivery, equality & diversity, contractor mileage and supply chain management. SBS managed this reporting process for and alongside Riverside to enable the client to maximise its ERDF funding claim. The information was submitted on a daily / weekly basis. SBS created a Dropbox account that allowed it to submit information in a quick and simple format, giving Riverside’s team the ability to access it at any time, and to check for compliance. Though the delivery programme was very tight, SBS met it, achieving the required number of properties by the end of November. This enabled Riverside to utilise additional match funding to extend the programme (into January 2015) and to provide energy efficiency measures to other properties. 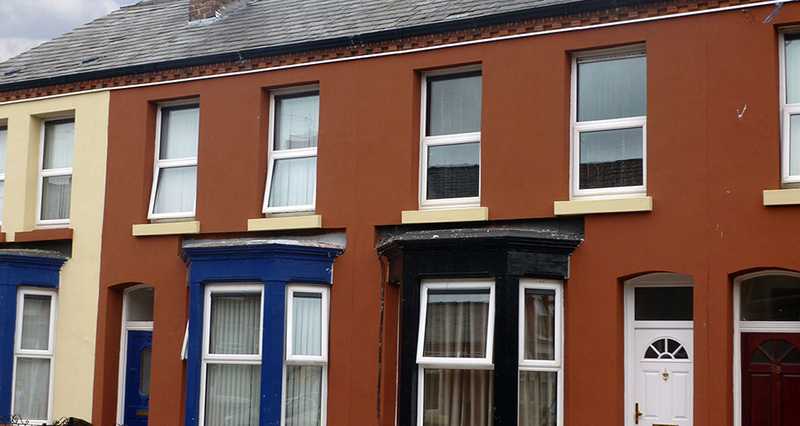 In total, SBS installed EWI and associated works to 81 occupied properties. This project was subject to KPI measurement, managed by Riverside’s consultants, EC Harris. Overall tenant satisfaction scores exceeded 90%. Having successfully completed phase 1, SBS then tendered via the Fusion21 Insulation Framework and subsequently won and delivered a second 'fast track' phase of the project. Phase 2 was tendered in two lots. SBS was awarded both lots after a price and quality tender exercise. The two lots were worth approximately £2.5million, but had to be delivered in a five month period, ending in September 2015. This once again imposed a need for very rapid progress and strict quality control, but by applying the same procedures used in phase 1, SBS was nevertheless able to deliver on time and on budget. Commenting on the first phase of the work, Riverside's Project Manager Mike Boyle said: "Sustainable Building Services recently completed a £500,000 external wall insulation programme for Riverside Housing Group on time and within budget. I found SBS excellent to work with. They completed this contract within a very tight timescale in a very challenging area of Liverpool and were extremely pro-active in ensuring that disturbance to our tenants & their neighbours was kept to a minimum. I would have no hesitation in employing this contractor for any future works of a similar nature."